Hamsa, the fine dining restaurant at Adyar, was the venue for the recent launch of a brand new product - artisanal chocolates. 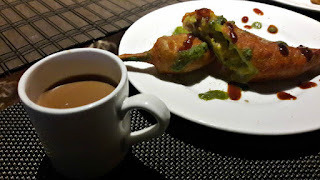 A tasting and appreciation session was organised for a group of us bloggers in the plush settings of the restaurant and the session was conducted by L.Nitin Chordia of Cocoatrait. 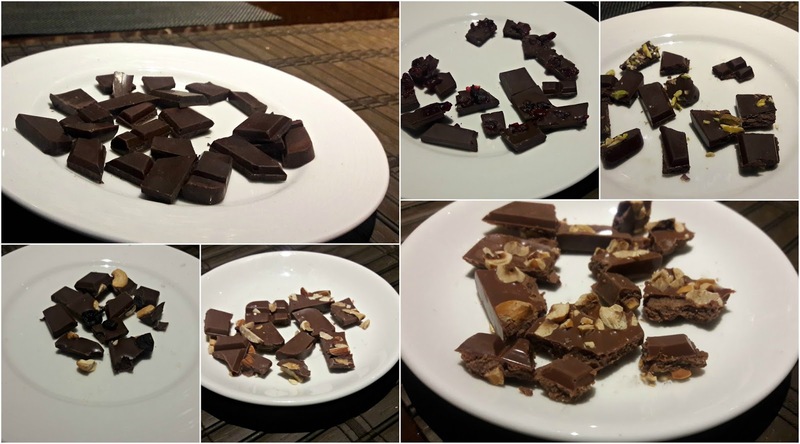 Nitin is India's only certified chocolate taster; I have attended some of his chocolate lectures and marvel at the way his passion for theobroma cacao rubs off onto his listeners with each telling. Hamsa Handmade has been curated by Cocoatrait. Good chocolate is a mixture of cocoa solids, cocoa butter (not vegetable oil), sugar and milk, as in the case of milk and white chocolate. Nuts, dried fruit and flavourings are optional. 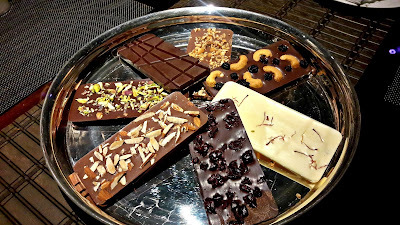 Seven chocolates were being introduced, but before that, Nitin took us through the regions where cacao is grown and the delicious process by which a cacao pod is transformed into the end product - either a bar of chocolate or cocoa powder. Our first tasting was a single origin 65% plain bar made from beans grown in Venezuela. We were instructed to place the piece of chocolate on the tongue and to allow it to melt without biting it. As it melted, we were asked to list out what we could taste... bitterness, fruitiness, acidity. A sip of water was necessary to cleanse the palate before tasting the next bar. A single origin 64% bar from Madagascar topped with Canadian cranberries and Himalayan pink salt, it had bitterness from the cacao, slight tartness from the berries but everything was perfectly balanced by the sprinkle of salt. Dark milk was what we were given to taste next. With 55% cacao content, it was a mix of South American and African beans and topped with pieces of roasted American pistachios. This one is definitely for nut lovers as the pistachios were beautifully roasted and generously scattered over the top. American blueberries and cashewnuts from Mangalore topped a 53% bar, again a South American/ African blend. If dark chocolate is not your cup of tea and you find regular milk chocolate too milky, both the 55% and 53% dark milk will be better choices. These bars have the characteristic acidity, fruitiness and bitterness of dark chocolate but are more palatable. Two milk chocolates to taste - a 38% blend of African beans topped with roasted American almonds. A sprinkle of rock salt was perfect to cut down on the sweetness and the almonds were a delightful addition though I did find the chocolate was a little grainy. The other 38% bar from the same region, was smoother on the palate and had Turkish hazelnuts as topping. I could taste just a hint of coffee and Nitin explained that it was due to the roasting of the hazelnut. There's nothing that I like better than a bar of white chocolate and that's because I'm not a chocolate snob. 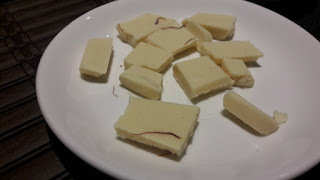 This creamy white bar was filled with the aroma of Spanish saffron, strands of saffron decorated the top and the combination of flavours was smooth and sophisticated. We also learnt that chocolates should be stored in a cool place like a bedroom cupboard and not in the fridge. A good chocolate has to be enjoyed at room temperature, allowed to melt slowly on the tongue.